Having approximately 2 meters wall thickness, the breath taking structure covers the inside field of 3165.5 m2. At the beginning it consisted of three main doors but later another door named ‘’Hunkar Door’’ was added here in 1740. Additionally, it has a roomy and spacious serving area for five thousand people. 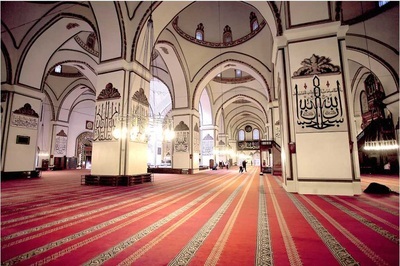 Great mosque possesses five segments and each segment contains four domes. 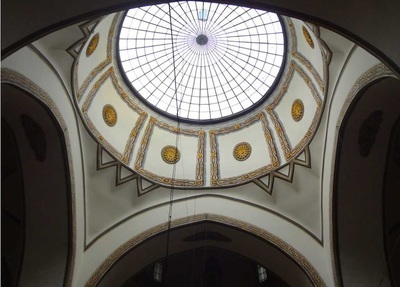 All domes were approximately similar in size but the center dome was established hypaethral. The rain, which through this wire fenced dome, fell in the pool underneath and the light from the dome enlightened the mosque. Today the dome is covered with glass and cannot be used to collect rain water however it is still breathing the mosque. The water tank with a fountain right underneath this dome has eighteen corners and gives a ravishing atmosphere to the mosque. The pool can be used for ritual ablution (washing) and is one of its kinds. 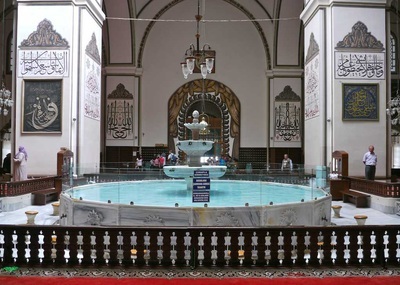 The pool is furnished with fascinating glass and this feature illuminates the mosque with natural light. Great Mosque, which is the most effective construction of its time, both from the viewpoint of the workmanship and the architecture was established with smooth cutting stones. Pointed arches have been built for all domes at the facades to decrease the massive effect of the thick walls which every arch contains double lined two windows inside. There are also found many different charming windows at all facades. The mosque has two minarets and minaret balconies are the same in each one and are furnished brick muqarnas. Moreover the octagonal pedestal made of marble while the body is made from brick. 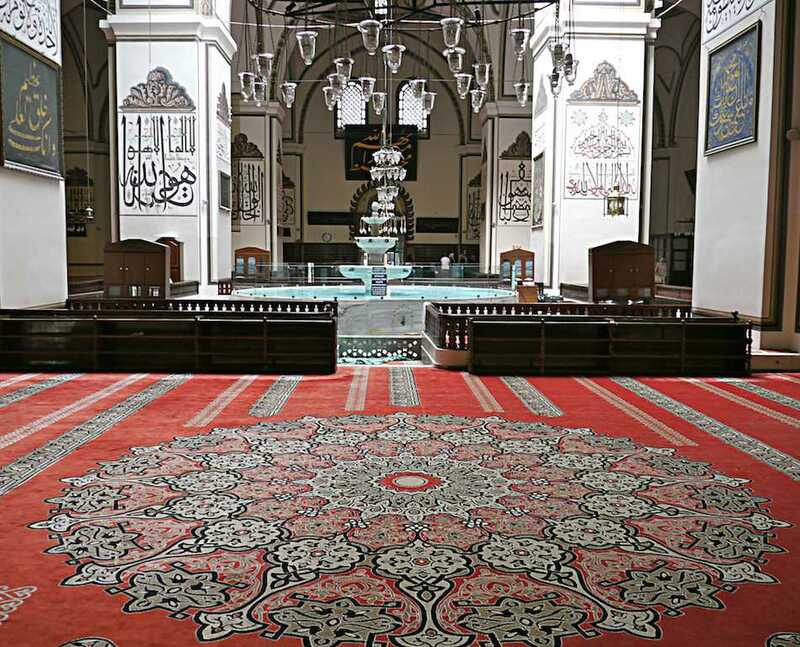 Today, Great Mosque is visited especially for its 192 unique wall inscriptions in addition to its valuable clocks and candelabras. That structure hypnotizes visitors with its mystical quality. Within that part, there are found many precious plaques written the 99 names of God (Allah in Arabic), verses of the Koran, Hadiths and words of wisdom which symbolize the faith, religion, generosity, self-sacrifice, justice, prayer and pilgrimage. 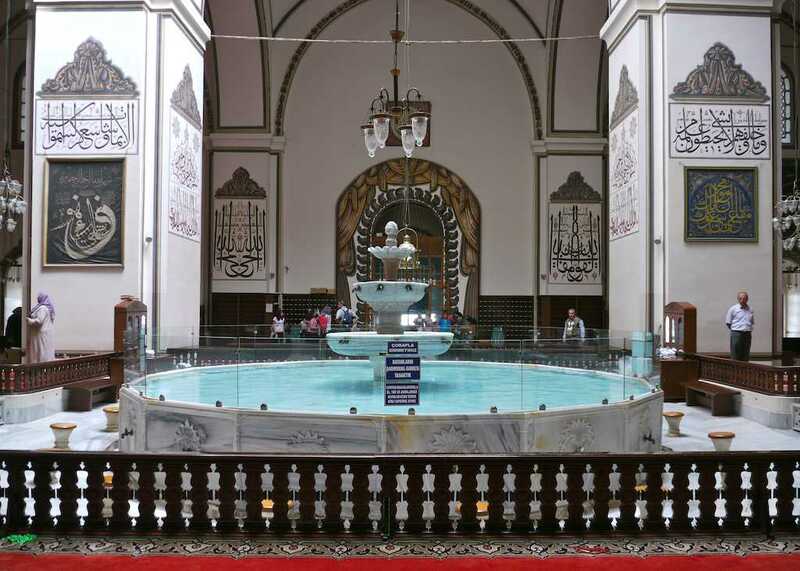 That refreshing pool was built by Kara Celebizade Abdulaziz Efendi. Evliya Celebi (a traveller) mentioned that once upon a time, within that pool included many salmons in his book. The water of sadırvan flows to pool from 33 different sides by bubbling at the top. 33 separate water ways reflect the worshipping for God. Except for those features, the dome located on the sadırvan was made from the glass in order to illuminate the mosque. Also that upper place on this dome is open air which refreshes the visitors and creates climate effect by making air circulation. When you step into the mosque, you can see the letter vav with precious tulip decorations in everywhere because it symbolizes Allah (cc) God. 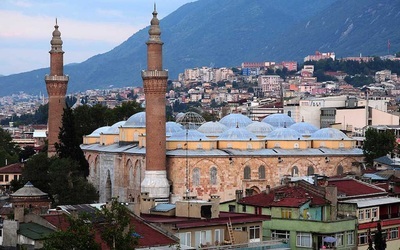 Moreover, there is a story about the symbol ‘’و’’; Once upon a time, Somuncu Baba realized the prophet Hızır in this mosque when he was distributing the bread to the workers of mosque. Then he said him if you do not visit this building, I will tell those people who you are in real. 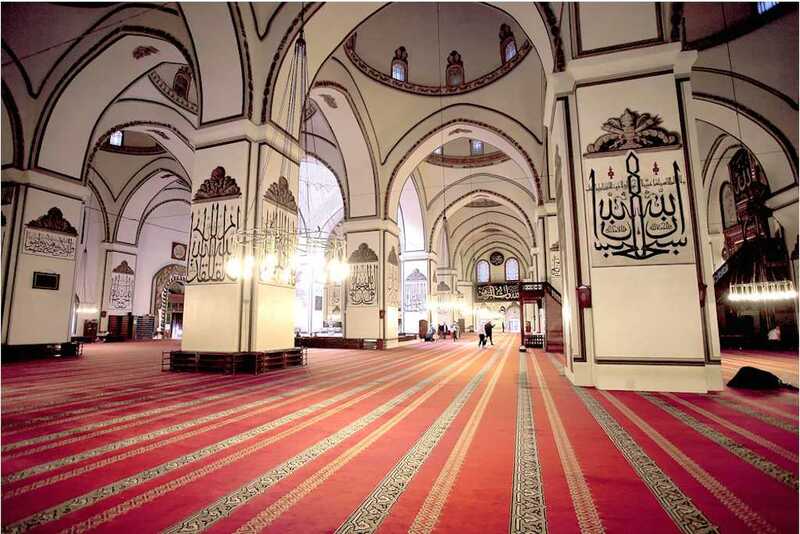 Prophet Hızır said ‘’I will come here but I do not state you at what the time I visit. 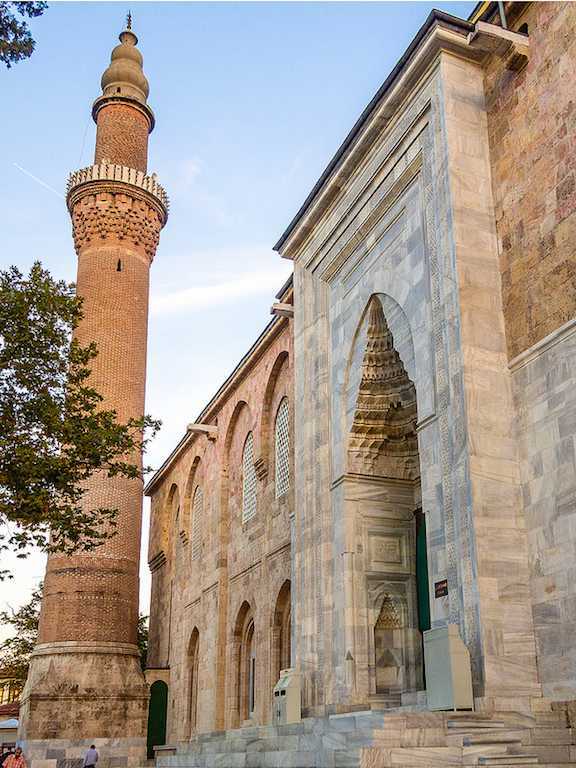 Since then, it is believed that Prophet Hızır has performed the salaat in the front of the famed letter vav. Built by Ottoman Sultan Yıldırım Bayezid Khan in 1402, the mysterious mimbar of Great Mosque attracts the people because it represents the universe; when it is looked at those motives upon the wooden mimbar, it shows us that the solar system is carved into the wood mimbar. The planets are carved into the wood by taking into account their distance from the sun and their proportional sizes. Therefore, today the people wander what does it mean.